Thanks to Adopt-a-Gym, students at five HISD elementary schools have new soccer balls and helmets, hula hoops, and more new gym equipment. Founder Kevin McGrath was in Houston on Friday, May 18, presenting athletics supplies to five elementary schools: Hilliard, Pugh, MacGregor, Mitchell, and Anderson. McGrath selected these five schools to receive a total of $15,000 worth of equipment because of all they lost during Hurricane Harvey. Adopt-a-Gym is a “by kids, for kids” fundraiser, where schools raise funds to purchase physical education equipment for other schools that are short on resources. Funds are raised through fitness events such as fun runs, dance-a-thons, and other active events. The program is several years old and operates out of Charles Barrett Elementary School in Alexandria, Va., where McGrath teaches. To see other schools Adopt-a-Gym has donated to, visit their website here. This entry was posted in Achievement/Recognition, Elementary Schools, News and tagged Anderson Elementary, Hilliard ES, MacGregor ES, Mitchell Elementary, Pugh Elementary School on May 21, 2018 by HISD Communications. Editor’s Note: Black History Month runs from Monday, Feb. 1, through Monday, Feb. 29, this year, and HISD is celebrating with a series of weekly stories recognizing distinguished African Americans who graduated from district high schools. This third article focuses on alumni who went on to have successful careers in the fine arts. The first and second articles spotlighted professional athletes, and lawmakers/politicians (respectively). Others will feature educators and those with careers in radio, TV, and film. HISD has a wealth of African-American alumni with talent in the performing and visual arts — and many of these distinguished graduates have chosen to share their gifts with later generations of students. This entry was posted in Achievement/Recognition, District II - Rhonda Skillern Jones, District IV - Jolanda Jones, District V - Sue Deigaard, District VII - Anne Sung, Fine arts and tagged Gregory Lincoln ES, HSPVA, Kashmere HS, Lamar HS, MacGregor ES, Piney Point ES, Sterling HS, Washington HS, Wheatley High School, Yates HS on February 15, 2016 by HISD Communications. A group of educators from HISD, including three librarians—Jo Reed (Scroggins ES), Cheryl Hensley (MacGregor ES), and Sue Carnes (Bell ES; now retired)—was recognized recently with the Wayne Williams Library Project of the Year Award for 2015 by the Texas Library Association. The librarians were selected for coordinating schoolwide reading campaigns at their respective campuses based on the Lunch Lady series of graphic novels by Jarrett J. Krosoczka. 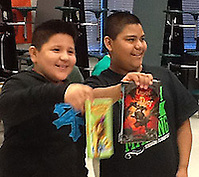 The project not only built on students’ enthusiasm for graphic novels, but also increased their awareness of health and nutrition through a cleverly organized partnership with HISD Nutrition Services Dietician Jennifer Lengyel that connected daily meal offerings to literature. The project was so successful that at Scroggins, interest in graphic novels spurred the principal to quadruple the school’s collection of that type of book from 12 to 48. At MacGregor, circulation of the Lunch Lady books increased by 90 percent. And at Bell, the demand for graphic novels increased so much that emergency rations of books had to be secured. The Wayne Williams award is designed to recognize a project that exemplifies the highest levels of achievement, professional standards, and inspiration to other libraries. 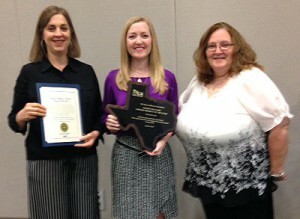 Reed and her colleagues were formally honored during a special ceremony held on April 15 at the Texas Library Association’s annual conference in Austin. This entry was posted in Achievement/Recognition, District IV - Jolanda Jones, District VI - Holly Maria Flynn Vilaseca, District VIII - Diana Dávila, Literacy and tagged Bell ES, librarian, MacGregor ES, Scroggins ES on April 16, 2015 by HISD Communications. Guests at HISD’s 2015 State of the Schools luncheon got a side order of entertainment with their meal. Westside High School’s Wind Ensemble of 35 students provided music throughout the program under the guiding hand of Conductor Joey Brunson, and students from 19 HISD elementary schools sang the national anthem. This entry was posted in District I - Elizabeth Santos, District II - Rhonda Skillern Jones, District III - Sergio Lira, District IV - Jolanda Jones, District IX - Wanda Adams, District V - Sue Deigaard, District VI - Holly Maria Flynn Vilaseca, District VII - Anne Sung, District VIII - Diana Dávila, Fine arts, State of the Schools and tagged Askew ES, Billy Reagan K-8, Burbank ES, Burrus ES, Cage ES, Herod ES, Ketelsen ES, Lovett ES, Lyons ES, MacGregor ES, Park Place ES, Parker ES, Pleasantville ES, Poe ES, River Oaks ES, Rodriguez ES, Roosevelt ES, The Rice School, Travis ES, Westside HS on February 12, 2015 by HISD Communications. It’s one thing to hear about inspiring, but long-dead, historic figures as a part of Black History Month, but it’s another entirely to have a living, breathing legend in your classroom—and almost beyond imagining that as a student, you might get to work alongside that person on a creative project. 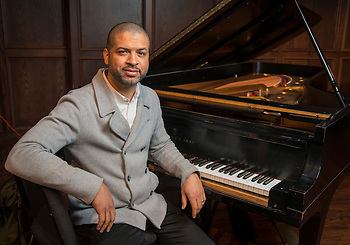 But that is exactly what students at three HISD schools will be doing over the next couple of years, as a part of the Jason Moran Homecoming Residency sponsored by Da Camera. This entry was posted in District IV - Jolanda Jones, District V - Sue Deigaard, District VIII - Diana Dávila, Fine arts, HSPVA and tagged Black HIstory Month, Da Camera, Gregory Lincoln ES, HSPVA, MacGregor ES, Selma on February 4, 2015 by HISD Communications. The first day of school is right around the corner, but teachers are still busily preparing for its arrival, learning about the many new resources available to them and their students at the Personalized Learning Institute (PLI). This entry was posted in Elementary Schools, Literacy and tagged Janowski ES, Literacy By 3, MacGregor ES on August 19, 2014 by HISD Communications. Jason Castro is usually knowing for his catching prowess on the baseball diamond, but on May 29, he was delivering a pitch. The professional athlete was at Scroggins Elementary School last Thursday to persuade young learners to continue reading for pleasure over the summer months, and to improve their chances of doing that, he helped distribute some of the 7,200 books he and his wife had donated to two HISD campuses. The books were divided between Scroggins and MacGregor elementary schools, and students at each campus got to select up to five books to take home and keep. A hundred lucky families also got to attend the Houston Astros’ evening game against the Baltimore Orioles. The donation was coordinated through the literacy foundation the couple started, called Castro’s Kids. This entry was posted in Elementary Schools and tagged MacGregor ES, Scroggins ES on June 4, 2014 by HISD Communications. Twenty HISD magnet school programs that are not drawing enough students from outside their neighborhoods will be closed after the 2013-2014 school year under a plan announced Thursday. These 20 magnet school programs enroll a combined 758 students from outside their attendance zones. This entry was posted in Magnet/School Choice and tagged Attucks, Burbank Middle School, Crespo ES, Deady MS, Dowling MS, Elrod ES, Garden Villas ES, Helms ES, Hogg Ms, Holland MS, Jackson MS, Jones HS, Kashmere HS, Key MS, Lee HS, Long, MacGregor ES, Madison HS, Patrick Henry MS, Pleasantville ES, Pugh ES, Ross ES, Scarborough High School, Sterling HS, Wainwright ES, Washington HS, Wesley ES, West University ES, Westbury HS, wheatley hs, Worthing HS on October 17, 2013 by HISD Communications.